Respected Yorkshire fabricator Dempsey Dyer has strengthened its industry-leading door portfolio with the adoption of the much-celebrated Ultion lock. 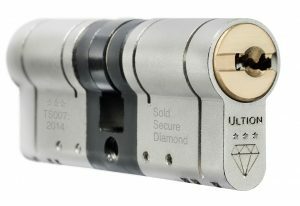 Achieving Secured by Design, BSi and Solid Secure Diamond status, the Ultion lock is one of the most highly accredited lock systems ever manufactured. The moment that it detects forced entry, the Ultion activates a specialised attack lock housed directly in the system’s central cam. Even if the intruder manages to get past its two sacrificial sections, they can’t get to the safety lock as it is embedded in molybdenum, a metal alloy 25% denser than iron. Founded in 1977 by brothers Tom and Bob Dyer, and today run by Tom’s son Peter, Dempsey Dyer is currently celebrating its fortieth year and is proud to still be a family-owned and run business. In the decades since, the Yorkshire-based fabricator has grown to become one of the region’s foremost providers of timber and Deceuninck uPVC. In recent years, the company has combined the two specialisms to produce the Beaumont window range, mechanically-jointed uPVC frames with an authentic woodgrain appearance.